Arab terrorist stabs Israeli man in central Israel, leaving him in moderate-to-serious condition. 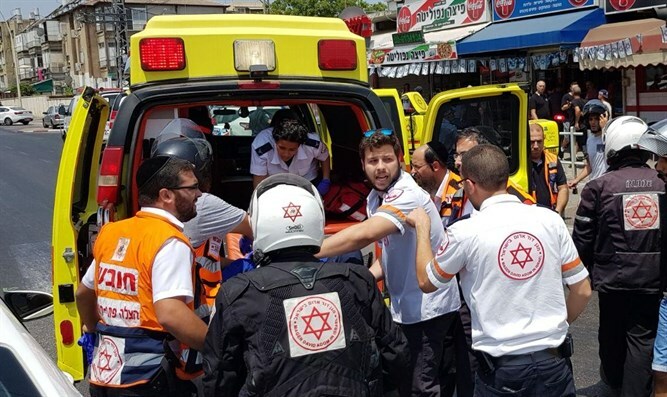 An Arab terrorist repeatedly stabbed a 32-year old Israeli man in the central Israeli city of Petah Tikva on Monday. The incident occurred at approximately 11:40 a.m. at the corner of Orlov Street and Bar Kochva. Authorities say the assailant has been neutralized and taken into custody. According to initial reports, the victim was stabbed in his neck and upper torso, and is now in moderate-to-serious condition. MDA emergency medical teams treated the stabbing victim at the scene, then evacuated him to Beilinson Hospital. A police spokesperson has confirmed that the assailant is a resident of the Palestinian Authority-controlled city of Qalqiliya, and that his victim is an Israeli citizen from the Israeli Arab city of Arara near Umm al-Fahm. The stabbing took place just outside a shwarma shop. Police say that the 21-year old terrorist was illegally residing and working in pre-1967 Israel. Based on the initial investigation, say authorities, the incident appears to be an act of terrorism. MDA officials reported that the victim was fully conscious and in stable condition after the stabbing. Tom Dagan, a member of MDA’s medi-cycle first responder unit, described the scene of the stabbing.